Befitting of this five-star experience, Verdura is home to two championship golf courses designed by world-famous architect Kyle Phillips. With the likes of Kingsbarns and the Grove already amongst his past successes, Phillips has set about creating a golf experience which defies its youth and draws on ancient heritage from Scottish links courses normally found along the East Lothian coastline. 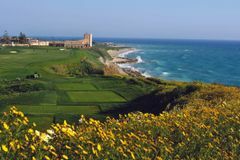 Set against the stunning backdrop of Sicily’s charming coastline, Verdura is a paradise for golfers looking to enjoy the epic Mediterranean sun. As Sir Rocco Forte’s first golf resort offering, Verdura Golf Resort and Spa has set out its stall amongst the very finest of golf holiday destinations. The accommodation is the picture of 5-star luxury, with enchanting ocean vistas and the beach just metres away. The two championship offering in both the East and West courses, measure in excess of 7,400 yards, and ensure anyone fortunate to walk their fairways will have the full repertoire of their golfing armoury tested. With dramatic coastline vistas and impressive natural landscapes, Verdura has been created with tournament golf in mind, however given the range of tees on offer golfers can play the courses at a length suitable to them. Be sure to take your camera on the golf course with you, some of the views from the ocean holes will be the best snap of your holiday! Verdura Golf and Spa Resort accommodations are of the very highest specifications. Each of the 203 exquisitely designed rooms and suites offers an unobstructed view of the beautiful Mediterranean Sea. With a range of rooms on offer from elegant Deluxe Rooms to the opulent Presidential Suite, golf holiday makers will find themselves catered for to the very highest level after their golf has finished. Although golf is often at the forefront of anyone visiting Verdura, those wishing for a relaxing break can enjoy a wealth of activities away from the fantastic golf courses. The spa itself is one of the largest and most comprehensive in Europe, with 11 treatment rooms as well as outdoor treatment space, guests can enjoy a range of treatments using local produce from the Island.